This Gulet Nika 5 is a 30 meter long wooden gullet with 8 cabins, and she can accommodate up to 16 guests. You can enjoy blue voyage tours on the Mediterranean and Aegean Sea, and around the Greek islands. Three crew members are at your service. We have separate recreation and living areas for our staff. All cabins have split air conditioning and a private bathroom, including a WC and a shower cubicle.This gulet has 6 double cabins and 2 triple cabins. We have a fully equipped kitchen, bar, ice machine, freezer, fridge. For all our guests, there are sunbeds available to relax and sunbathe, an indoor and outdoor dining/sitting area. Also on board is a music player, LCD TV, board games, snorkels & masks and fishing lines. A dinghy with outboard engine, a ship-to-shore radio, radar, navigation devices, mobile telephone and life jackets are on board. 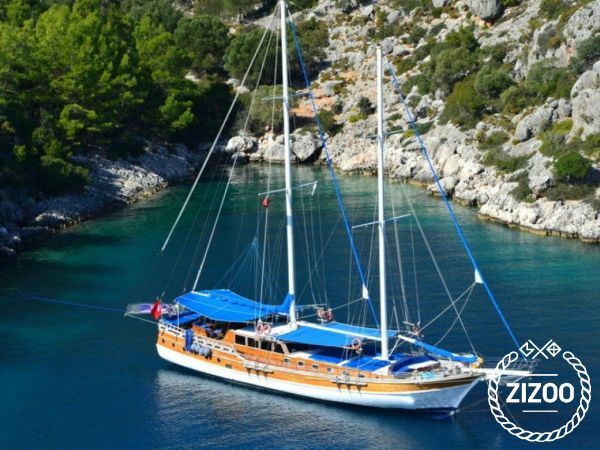 This gulet is government approved with a fully qualified captain and crew. You can find yourself sailing in waters of the Greek islands, Rhodes, Kos, Symi, Tilos and so on. The sailing yacht is an excellent charter choice for a perfect blue voyage vacation. Enjoy the sea and the sailing excitement with the comfort of your home!